Fall Mantle: Fist Bump I Only Spent $6.41 on this Bad Boy! I wrapped up decorating my fall mantle this week and there are two amazing points to this statement. First, I must note for the first time in my life I actually didn't wait to dig out my fall decorations ten seconds before fall was over and secondly, I only spent $6.41 to put this bad boy together. Can I get a hallelujah! As some of you know, our fireplace had a Joan River's style face lift last fall (thankfully, ours came out looking much better than hers). So I was super duper excited to decorate this year. 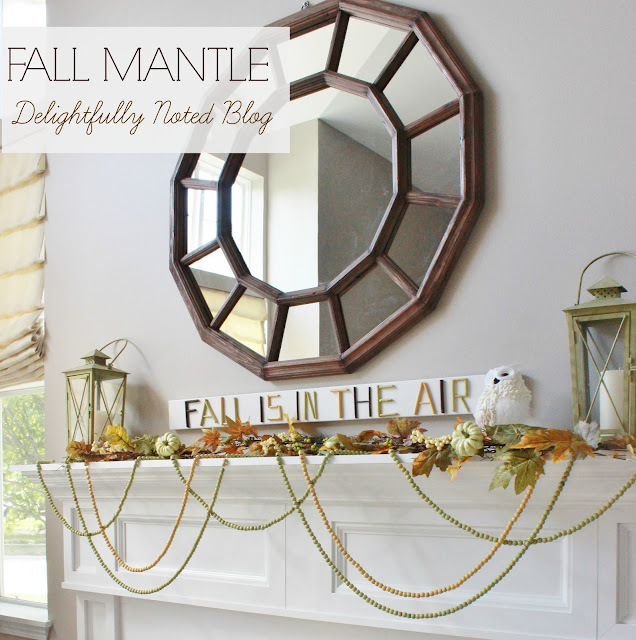 The "fall is in the air" twig sign was a DIY project I shared with you all a few days ago. The lanterns were from Kirkland's Home (I think...they were purchased years ago). Mr Owl was a gift from my dad last Christmas. Something my parents found on one of their many travels around the country. I love that dang owl. Of course, I realize in real life owls are typically bigger than lanterns and pumpkins but this is an itty bitty, magical owl PEOPLE! I found the fall garland at Michael's for half off. The beaded garland was a fun find at Goodwill a few weeks ago. I found three strands each for just forty-seven cents. They were Christmas garland but I brought them home and prettied them with some spray paint. The large white monogrammed pumpkin I made last year with some scrapbook paper. The little white pumpkin was from Michael's and the taupe pumpkin was a Dollar Store pumpkin that I antique glazed last fall as well. The wooden stool is something that has been sitting on my project-to-do-list for weeks now. I'm going to make it over for Baby B but I haven't decided on what the heck I'm doing with it yet. So in the mean time, it serves as a wonderful pumpkin base. So there you have it....my first attempt at decorating a mantle for fall. I'm really pleased with how simple and aetestically clean it looks. But I'm doublisicious excited that I was able to decorate by using a lot of stuff I already had lying around the house. Now it's on to the front porch! Have you started decorating for fall yet? You did a wonderful job! I am trying to get myself inspired to take down my summer/patriotic stuff and decorate for fall. It is still so darn hot here! Your mantle looks beautiful! Great idea on spray painting those beads! So pretty! Just love thrifty home decor, especially when it looks like yours! Great job! I love it! I need to get to work on mine too..